As many as 12 of 17 states in the Reserve Bank of India’s non-special category grew faster than the growth pace of the national economy in 2018, a Crisil report has said. In its report titled ‘States of growth 2.0’, Crisil said, “As many as 12 of 17 states in the Reserve Bank of India’s non-special category grew faster than the 6.7% pace the national economy clocked in fiscal 2018”. Crisil said that the growth however has not been equitable. “Low-income states have not sustained high growth long enough to meaningfully bridge the per-capita income gap with the high-income states. In fact, the chasm is widening,” the report added. Moreover, growth has not quite been conducive to job creation in a majority of the states. 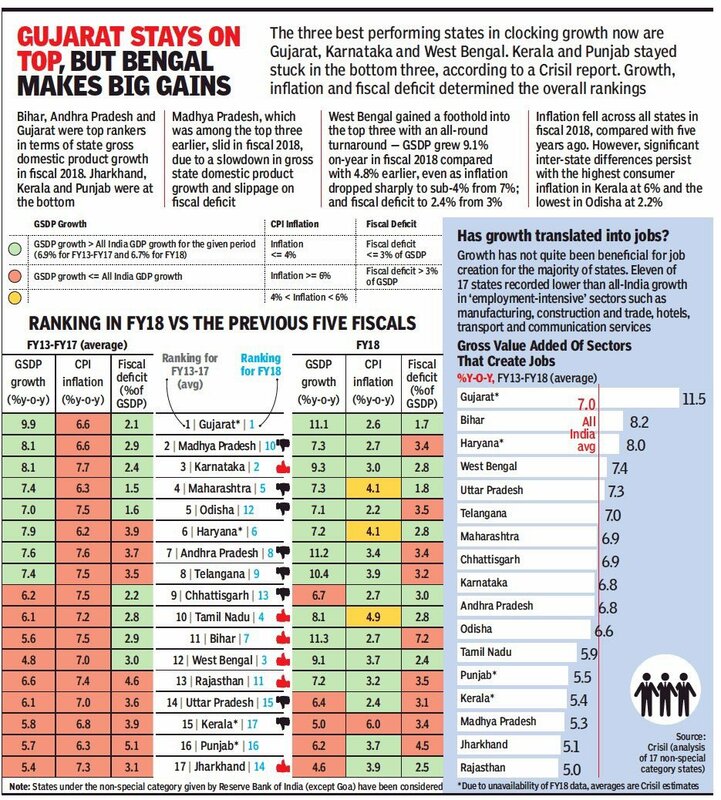 That’s because 11 states have recorded lower growth in ‘employment-intensive’ sectors such as manufacturing, construction and trade, and hotels transport and communication services, compared with the national rate, it said. Crisil report found that on the fiscal front, most states veered off the Fiscal Responsibility and Budget Management Act (FRBM) line. “Despite this, due to little fiscal legroom for the Centre and increased share of states in central transfers, states are now the new engines of public spending. Although Uttar Pradesh, Karnataka and Bihar were the biggest spenders overall, Rajasthan, Jharkhand, Uttar Pradesh and Telangana topped the list of states that spent the most out of their budget on capex,” Crisil said. It added that the spending is not as much as they ought to be in health and education. The debt ratio was over 30 percent in Punjab, Rajasthan and Kerala, while Chhattisgarh, Maharashtra and Karnataka managed to keep it relatively low. For most states, an increase in the primary deficit (which captures the current fiscal stance of the government) was the major cause of the rise in the debt ratio, the report added.